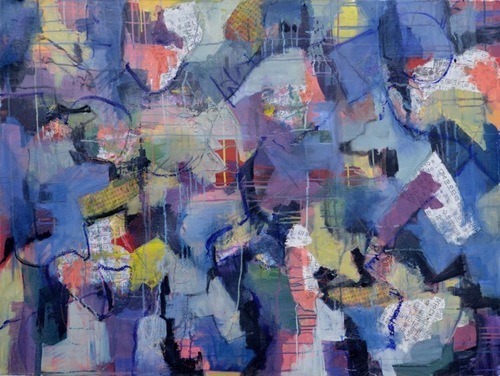 Local artist, Jane Johnson, is exhibiting her work now through November 18 at Vastu (1829 14th Street NW). Johnson’s work incorporates aspects of collage through use of layering and combining different textures. The use of color, drawing and organic shapes are also evident in Johnson’s art. Johnson, a DC area resident for 27 years, fostered her love for art when she was very young. She started out drawing and eventually took painting classes and went on to earn a BFA in Fine Arts from Stratford College in Danville, Va.
After school, she painted off-and-on and created illustrations for the Virginia Seasons cookbook for the Junior League of Richmond. Now, Johnson works almost exclusively in mixed media, combining her long history of oil with loose drippy acrylic paint and collage. “I also use oil stick, graphite and oil pastels so my work is a true mix of many mediums. The work is all very textural with a bold use of line and color,” said Johnson. Johnson is an active member of the DC art scene, and has participated in Atromatic, shows at The Target Gallery and the RawArtists Mixology Show. After her show at Vastu, Johnson will exhibit her work at Artspace in Herndon, Va., starting in early December. Interested in learning more about Johnson? Check out her website or visit Vastu to view her work. Vastu is open Monday through Saturday, 11 am – 7 pm, and Sunday from noon until 5 pm. Wandering through Gallery 102's recent show "Lost In Translation"